The Belarusian People's Republic (Belarusian: Белару́ская Наро́дная Рэспу́бліка, [bʲeɫaˈruskaja naˈrodnaja rɛsˈpublʲika], transliterated as Biełarúskaja Naródnaja Respúblika, BNR; Russian: Белорусская народная республика, translit. Belorusskaja narodnaja respublika), historically referred to as the White Ruthenian Democratic Republic (German: Weißruthenische Volksrepublik) was a failed attempt to create a Belarusian state on the territory controlled by the German Imperial Army during World War I. The BNR existed from 1918 to 1919. Land claimed by the BNR at the time. The BNR was declared on March 9, 1918, in Minsk by the members of the Executive Committee of the First All-Belarusian Congress, and two weeks later, on March 25, 1918, it proclaimed independance. In 1919, it co-existed with an alternative Communist government of Belarus (the Socialist Soviet Republic of Byelorussia, which later became part of the Lithuanian–Byelorussian Soviet Socialist Republic), moving its seat of government to Vilnius and Hrodna, but ceased to exist due to the capture of the whole Belarusian territory by Polish and Bolshevik forces during the Polish–Soviet War. Currently, its government in exile, the Rada (Council) of the Belarusian People's Republic is the oldest still functioning. The Belarusian People's Republic was declared on the territory of modern-day Belarus three weeks after the Treaty of Brest-Litovsk was signed on March 3, 1918 between the new Bolshevik government of Soviet Russia and the Central Powers in the border city of Brest-Litovsk. After the 1917 February Revolution in Russia, active discussions started in Belarus about either gaining autonomy within the new Russian Republic or declaring independence. Representatives of most Belarusian regions and of different (mostly left-wing) political powers, including the Belarusian Socialist Assembly, the Christian democratic movement and the General Jewish Labour Bund, formed a Belarusian National Council in late 1917. The Council started working on establishing Belarusian governmental institutions. Both the Bolsheviks and Germans refused to recognize it and interfered in its activity. However, the Germans saw an independent Belarus as part of the implementation of their plan for buffer states within Mitteleuropa. The Bolsheviks had negotiations with the Belarusian Democratic Republic regarding an eventual recognition, but later decided instead to establish a pro-Soviet government of Belarus - the Soviet Socialist Republic of Belarus. Parallel with negotiations that started between the Germans and Bolsheviks, the Belarusian Council started actively demanding recognition of autonomous status for Belarus, with continuing internal discussions on whether it should become an autonomous region within Russia or declare national independence. Aliaksandar Burbis, Jan Sierada, Jazep Varonka, Vasil Zacharka. Arkadz Smolich, Pyotra Krecheuski, Kastus Jezavitau, Anton Ausianik, Liavon Zayats. In its First Constituent Charter, passed on February 21, 1918, the Belarusian Council declared itself the only legitimate power in the territory of Belarus. On March 9, following the signing of the Treaty of Brest-Litovsk between the Germans and Bolsheviks, the Belarusian Council issued a Second Charter where it declared the establishment of the Belarusian People's Republic. The Belarusian Council became the provisional government of Belarus and was renamed the Council of the Belarusian People's Republic. On March 25, 1918, the All-Belarusian Congress proclaimed the independence of Belarusian National Republic (Bielaruskaja Narodnaja Respublika, abbreviated as BNR). The Government of the BNR left Minsk in December 1918 for the Lithuanian Republic, and in spring 1919 went into exile. In its Third Constituent Charter, the following territories were claimed for BNR: Mogilev Governorate (province), as well as Belarusian parts of Minsk Governorate, Grodno Governorate (including Belastok), Vilna Governorate, Vitebsk Governorate, and Smolensk Governorate, and parts of bordering governorates populated by Belarusians, rejecting the then split of the Belarusian lands between Germany and Russia. The areas were claimed because of a Belarusian majority or large minority (as in Grodno and Vilna Governorate), although there were also numbers of Lithuanians, Poles and people speaking mixed varieties of Belarusian, Lithuanian and Polish, as well as many Jews, mostly in towns and cities (in some towns they made up a majority). Some of the Jews spoke Russian as their native tongue; others spoke Yiddish. President and General Stanisław Bułak-Bałachowicz. There were attempts to create regular armed forces of the newly established Belarusian republic. Belarusian military units started to form within the disorganized Russian army already in 1917. General Stanisław Bułak-Bałachowicz supported the Government of BNR and openly positioned his army as a Belarusian national army, also acting as the first President of the Belarusian Provisional Government shortly after the downfall of the BNR before again handing power to the people. For his resistance against Bolshevik forces, members of Belarusian minority in Poland regard him as their national hero. The major military action of the Belarusian People's Republic army was the Slutsk defence action in late 1920. The Council of the BNR, based at that time in Lithuania, sent officers to help organize armed anti-Bolshevik resistance in the town of Slutsk. The Belarusian army managed to resist a month against the greater strength of the Red Army. During its short existence, the government of Belarus established close ties with the Ukrainian People's Republic, organized food supplies to Belarus from Ukraine and thereby prevented hunger in the country. Diplomatic representations of Belarus had been created in Germany, Estonia, Ukraine and other countries to lobby for Belarusian interests or to support Belarusian soldiers and refugees who landed in different parts of the former Russian Empire. Beginning in 1918, Anton Łuckievič, the Prime Minister of Belarus, met with Vladimir Lenin hoping to gain recognition for the independence of Belarus by Soviet Russia. The Belarusian delegation even proposed the creation of a federation with the RSFSR and the adoption of the Soviet Constitution in Belarus in exchange for Russia recognizing the independent status of Belarus, but Lenin did not agree to these proposals. Military and Diplomatic Mission of the Belarusian Democratic Republic in Riga. The government also managed to create between 150 and 350 schools and preparations for the creation of a University in Minsk were initiated. In 1919, a delegation of the Belarusian Democratic Republic under Prime Minister Anton Łuckievič participated in the Paris Peace Conference, attempting to gain international recognition of the independence of Belarus. On the way to the conference, the delegation was received by Czechoslovak president Tomáš Masaryk in Prague. During the conference, Łuckievič had meetings with the exiled Foreign Minister of Admiral Kolchak's Russian government Sergey Sazonov and the Prime Minister of Poland Ignacy Jan Paderewski. Being surrounded by more powerful neighbours and having no allies, the BNR quickly lost its independence and did not become a real state with a constitution or defined territory. However, many modern Belarusian historians suggest that creation of the Belarusian People's Republic was the reason for Bolsheviks creating the puppet Belarusian Soviet Socialist Republic and allowing some elements of national cultural life in the 1920s. In December 1918, the German army retreated from the territory of Belarus and the Red Army moved in to establish the Socialist Soviet Republic of Belarus. The Rada (Council) of the BNR moved to Grodno, the center of a semi-autonomous Belarusian region within the Republic of Lithuania. During the subsequent 1919-1920 Soviet-Polish War, the Rada went into exile and facilitated an anti-Communist struggle within the country during the 1920s. In 1925, the exiled government of the Belarusian Democratic Republic discussed relinquishing its authority in favor of the Belarusian Soviet Socialist Republic controlling the eastern part of Belarus. Despite many members of the democratic government advocating this idea, the proposal was not approved. During World War II, the Belarusian government-in-exile, based in Prague, refused to cooperate with Nazi Germany or with theBelarusian Central Rada, the pro-German puppet government, and issued statements in support of the Western Allies. The advance of the Red Army in 1945 forced the Rada of the BNR to relocate to the western part of Germany, occupied by British and American troops. In February 1948, the Rada passed a special manifesto, by which it declared its return to activity. In April 1948 the Rada, together with representatives of the Belarusian post-war refugees, held a conference in Osterhofen, Bavaria. After the dissolution of the Soviet Union in the 1990s, similar governments-in-exile of the neighboring countries (Lithuania, Poland and others) handed back their mandates to the corresponding independent governments. Upon declaration of independence of the Belarusian Soviet Socialist Republic in 1990, it was stated then that the Rada was ready to hand its status to a democratically elected parliament of Belarus. The parliament of Belarus of that time had been elected under Soviet rule. However, these plans were dropped after president Alexander Lukashenko, elected in 1994, established an authoritarian regime accompanied by a return to Soviet policies in regards to Belarusian language and culture. The Rada BNR still exists as a government in exile and attempts to lobby for interests of the Belarusian diaspora in countries where it has its representatives. Since the late 1980s, March 25, the Independence Day of the Belarusian Democratic Republic, is widely celebrated by the Belarusian national democratic opposition as Freedom Day (Belarusian: Дзень волі). It is usually accompanied by mass opposition rallies in Minsk and by celebration events of the Belarusian diaspora organizations supporting the Belarusian government in exile. A national flag of three stripes — white-red-white — was adopted, as well as a state seal (Pahonia) based on an emblem of the Grand Duchy of Lithuania. In 1998, Belarusian linguist and translator Siarhiej Shupa published a two-volume collection of BNR archives (Архівы Беларускай Народнай Рэспублікі. Менск-Вільня-Прага-Нью-Ёрк). The total size of the two volumes is more than 1700 pages. Essentially these are the processed and re-organized documents from the Lithuanian archival fund #582 in Vilnius and they constitute roughly 60% of all the BNR official documents from 1918. Another 20% of BNR official documentation is located in the Minsk archives, and the fate of the remaining 20% is unknown. ^ a b Ladysieŭ, U. F., & Bryhandzin, P. I. (2003). BNR: stanaŭliennie, dziejnasć. Ministerstva bielaruskich spraŭ pry Litoŭskaj Tarybie [BNR, its formation and activities. The Ministry for Belarusian Affairs under the Council of Lithuania]. In Pamiž Uschodam i Zachadam. Stanaŭliennie dziaržaŭnasci i terytaryjaĺnaj celasnasci Bielarusi (1917-1939) [Between the East and the West. The formation of statehood and territorial integrity of Belarus (1917-1939)] (pp. 117-119). Minsk: Belarusian State University. ^ Editorial (24 March 2005). "Belarusian Language Society greets nation on forthcoming BNR (Belarusian National Republic) anniversary". Charter'97 Press Center. Archived from the original on 2012-02-12. Retrieved 15 December 2012. ^ Ladysieŭ, U. F., & Bryhandzin, P. I. (2003). BNR: stanaŭliennie, dziejnasć. Ministerstva bielaruskich spraŭ pry Litoŭskaj Tarybie [BNR, its formation and activities. The Ministry for Belarusian Affairs under the Council of Lithuania]. In Pamiž Uschodam i Zachadam. Stanaŭliennie dziaržaŭnasci i terytaryjaĺnaj celasnasci Bielarusi (1917-1939) [Between the East and the West. The formation of statehood and territorial integrity of Belarus (1917-1939)] (pp. 84-88). Minsk: Belarusian State University. ^ Spencer Tucker & Priscilla Mary Roberts (2005). World War One. ABC-CLIO. p. 225. ISBN 1851094202. ^ Nadson, Alexander. March 25 and All That. The Journal of Belarusian Studies. Centre for Transition Studies & Anglo-Belarusian Society, Lulu.com. p. 113. ISBN 1291419942. ^ "3rd Constituent Charter of the BNR Rada". The Belarusian Democratic Republic official web site. Retrieved 15 March 2017. ^ a b "Selected Bibliography of works on the struggle for Belarusian Independence 1900–1921 in the Francis Skaryna Belarusian Library in London". The Belarusian Democratic Republic official web site. Archived from the original on 27 September 2013. Retrieved 15 March 2015. ^ "25 пытанняў і адказаў з гісторыі БНР" [25 questions and answers on history of BNR] (in Belarusian). Euroradio.fm. 24 March 2014. Retrieved 15 March 2015. ^ Сергей Крапивин (24 March 2009). "Баба с красным обозом перед "Европой"" [A woman with a red baggage in front of "Europa"]. Naviny.by. Archived from the original on 2 April 2015. Retrieved 15 March 2015. ^ Анатоль Грыцкевіч [ Anatol Hrytskievich ]. "Яго імя — сімвал нашай незалежнасці" [His name is the symbol of our independence] (in Belarusian). Zbsb.org. Retrieved 15 March 2015. ^ "95th anniversary of BNR" [The Belarusian People's Republic was declared on March 25, 1918.]. charter97.org. Retrieved 24 September 2017. 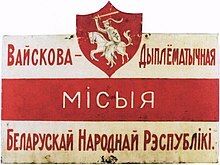 ^ "Чатыры ўрады БНР на міжнароднай арэне ў 1918–1920 г." [Four governments on international Arena in 1918-1920] (in Belarusian). Archived from the original on 2013-07-03. ^ Уладзімер Арлоў (11 May 2006). "Васіль Захарка" (in Belarusian). Radio Free Europe/Radio Liberty. ^ "The March 20, 2006 Memorandum of the BNR Rada". The Belarusian Democratic Republic official web site. Retrieved 15 March 2017.